As was the the G2, LG's G3 is one of the most leaked high-end smartphones of the year, and the information just seems to keep on flowing. 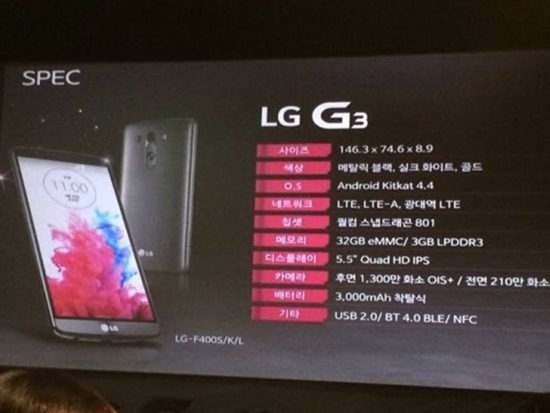 Today, GSM Arena posted images from an internal presentation on the G3 in Korea, and they basically confirm many of the device's suspected components. 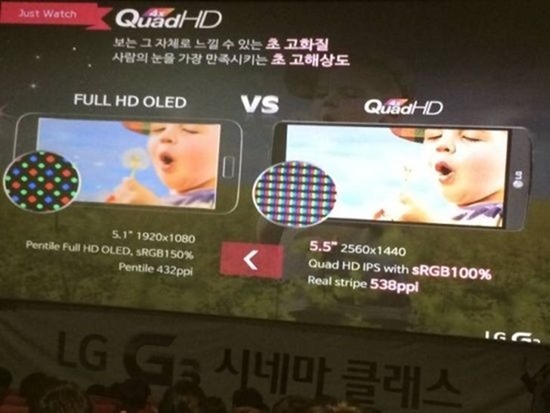 Perhaps most importantly, the G3 will apparently be the first major smartphone to launch with a QHD (Quad HD) display, something long predicted as inevitable in the race to ever-denser screens. 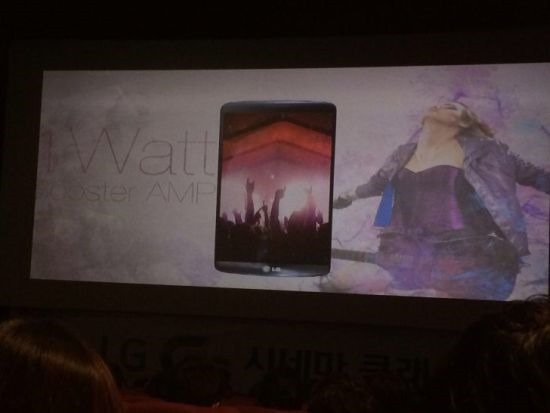 Like LG's previous panels, this will be an IPS display with a full RGB stripe subpixel layout. This increases effective pixel density, because there are actually substantially more subpixels in a full RGB stripe layout as opposed to other methods (like PenTile, or Samsung's proprietary striping patterns). LG also seems to think that a 100% sRGB gamut is better than a 150% sRGB gamut, though I don't think the marketing department quite gets what they're saying on that one. Also, the screen is freaking huge, at 5.5 inches. Beyond the display, the specifications are largely in line with what has been expected: a Snapdragon 801 processor, 3GB of RAM, 32GB of internal storage (no mention of an SD card slot), a 3000mAh removable battery, 13MP rear camera (with "OIS+"), 2.1MP front, and likely support for a range of LTE specifications. The camera isn't particularly detailed in the technical sense here, but we do know there's going to be some kind of fist-making gesture to snap a selfie (either squeezing the phone or your hand in the air, it's not clear). The rear camera's autofocus is talked about a lot, so we have to assume that laser on the back is indeed a thing and that it will be assisting with image focusing. 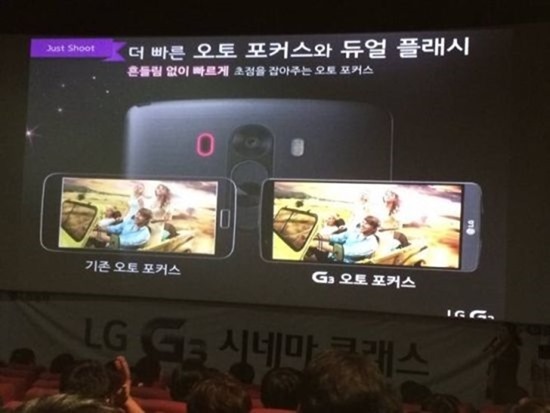 Our translator says this slide claims the G3 will have better, faster autofocus than the G2. The phone will also have a 1 watt external speaker, which is definitely good, as the G2's speaker was among the worst of last year's phones. 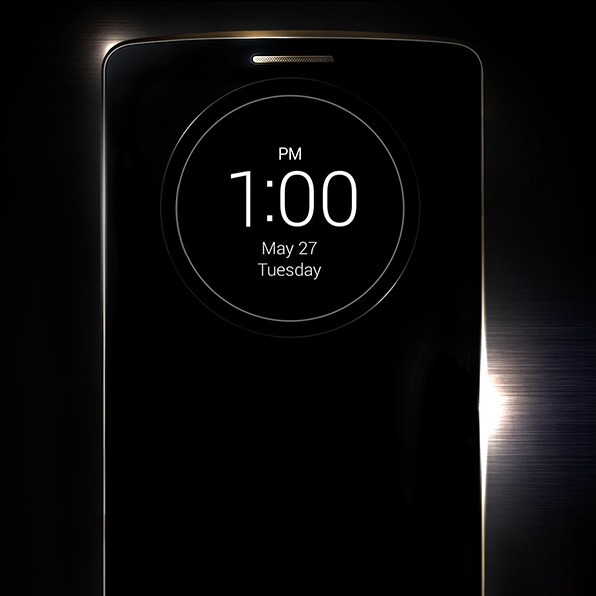 Other specifications include the dimensions (146.3x74.6x8.9mm), OS version (Android 4.4), and available colors (metallic black, silk white, gold).